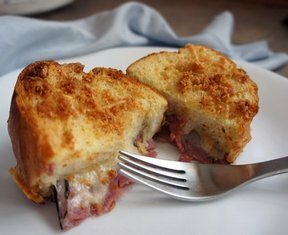 Grilled ham and cheese for breakfast...it doesn't get any better than this! The mustard adds a bit of tang to this melty comfort food. Perfect for overnight guests on Easter morning or for any Easter brunch. Let us show you how easy it can be to carve a ham if you just follow these helpful tips. Step-by-step instructions on how to put together a slow cooker breakfast bake that can be made up a head of time for your convenience.